The day started out fairly routine with a theft of cell phone and a civil dispute. Mid-afternoon an impaired driver narrowly missed a significant tragedy as his vehicle was launched off road and landed mere feet from a toddler. The driver sustained some injuries as he’d elected not to wear his seat belt as well. A platoon mate was first on scene and arrested the driver. I attended to assist with witness statements. The driver was injured enough that he ended up being taken to hospital and wasn’t able to provide a breath sample. I’ve had some experience with blood demands at the hospital as an alternate means to collect a sample so I offered to stay and help guide my platoon mate through the process. It seems that no matter how socially unacceptable drinking and driving has become, it’s still a major problem on the roads! The day was a fairy quiet routine day, a great chance to catch up on some paper work and ensure all my notes and involvement report were submitted for the impaired driving charges from the previous day. The shift kicked off with reports that there was some sort of oil spilled on one of the hills creating a hazardous situation. 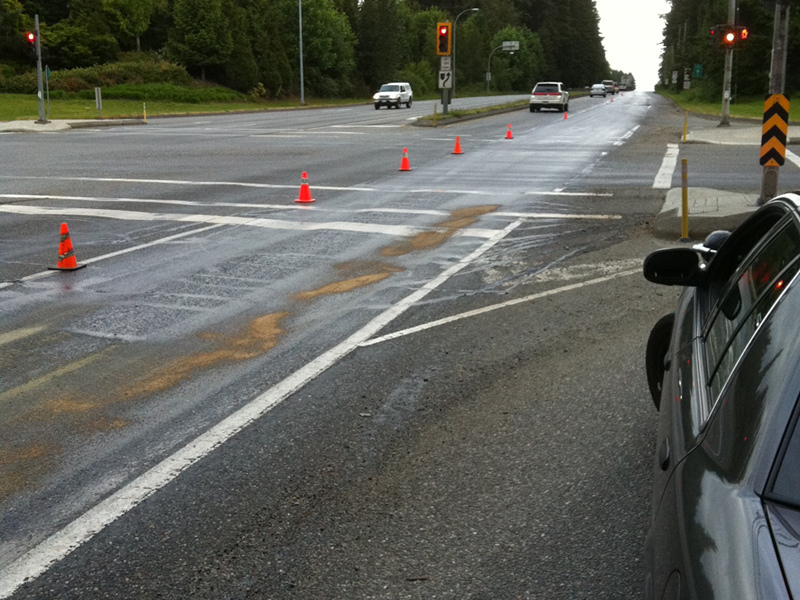 I arrived on scene to find that the curb lane was completely covered in fish oil for over a kilometer! As I arrived, a motorcyclist that had to cross the intersection cover in oil ended up low siding and crashing while turning. Fortunately the rider wasn’t injured and was able to ride away safely. The suspect tanker truck was caught a couple kilometers down the road. What an unforgettable smell, as cars spun tires trying to get up the hill and trucks sat idling over it at red lights it mixed with the asphalt and got warm. The rest of the night was consumed with another hit & run MVI with an impaired driver. I located the car with the driver still in the driver’s seat, arrested him and processed him. After briefing I was dispatched to a report of a residential break & enter. The suspect had broken a basement window while the family was at work and school for the day, rummaged through the whole house and left with a significant amount of property. Having had my home broken into I understand the feeling that your home has been violated. We take these very seriously. After collecting a detailed report of property taken and consulting with our forensic identification section I canvassed the neighborhood talking to neighbors in an attempt to identify a suspect or narrow down a time frame for the B&E. Any valuables that have serial numbers get entered onto our CPIC system so if they are checked in future any police officer in Canada can tell if they are stolen. It is helpful to record serial numbers of all your valuables!